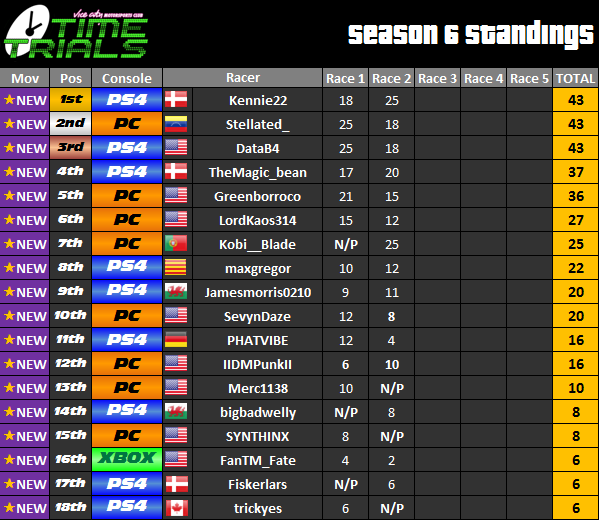 Time Trials | Points system changed. We are going to make some changes to the points system. All points given on Race 1 and 2 are going to be resetted and redistributed according to the new system. 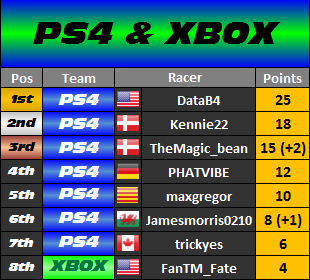 Race time bonus points will remain unchanged for previous races but from Race 3 forward will be awarded without podium restrictions (All drivers will be elegible for winning bonus points). I guess this is because of the whole FPS Discussion, I don't like it. 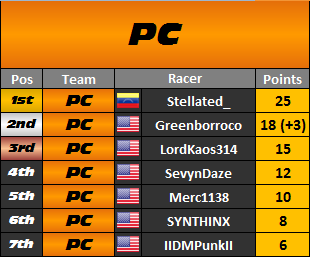 I'll have no chance at the S6 Standings due to missing a race, and I won't be able to steal them points now. 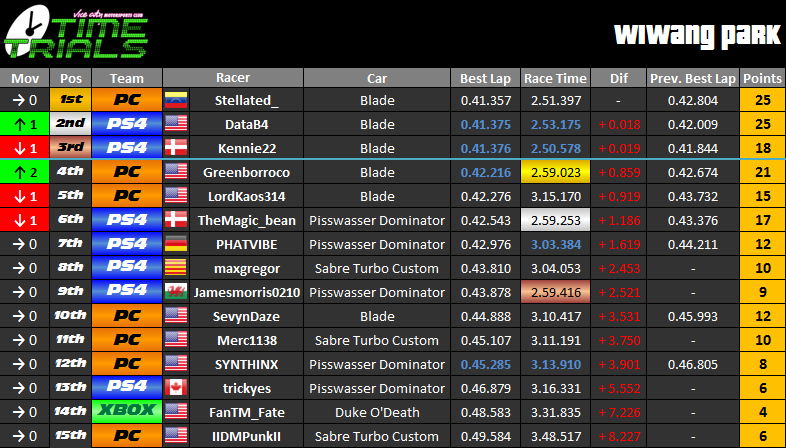 Not that I had much of a chance to begin with, Kennie22 and DataB4 would never fall below 4th place. 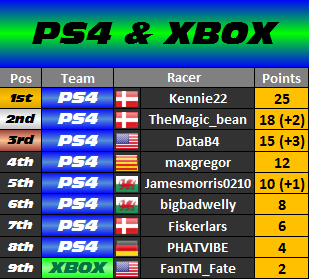 I'll still race for the fun though, shame I won't be able to win the season I had high hopes despise the challenge (the PS4 folk are really good drivers). Kind of... i'm still not 100% sure that even with the FPS capping PC and Consoles are playing in a leveled field. Making this points distribution people on consoles have more chances on the cross-platform competition and people on PC doesn't need to keep the FPS to 30. Plus... we added Team competition and other bonus prizes. - They start being challenged and now all of the sudden everyone complains. We all doing this for fun, and I'm not mad nor anything like that I just don't approve of the whole FPS matter and the changes that are being made because of it. Thanks @Stellated for all the hard work and effort you do for TT. I like the F1 points system. Also, not sure anybody was complaining about it. Cross platform used to be 360 v ps3. Maybe he saw potential problems by season end. People used to drop out if they felt it was over for them. Maybe these new categories add more chances for players to stay for the whole season. It is all just an experiment as we go along. We can iron out any problems now and avoid problems for season 7. Not exactly, this is the first time we do TT on next gen. Many people are on different consoles now: For example, I was on PS3 and now i'm on PC, and Data was on Xbox and now he's on PS4. The current teams are not the same as before. Nobody there is complaining about anything... I cannot emphasize this enough. Kennie brought up a video a week ago of the FPS in a joking way (all because i didn't believe that i won after all this time) but I took it seriously, made some tests and saw that it was true. I made the first move of asking to cap the FPS (annoying thing if you are used to the graphics of PC and the concept of playing without of shuttering), now i discarded that and made this change to ensure some fairness to the console side and we don't have to limit the graphics settings on our side. 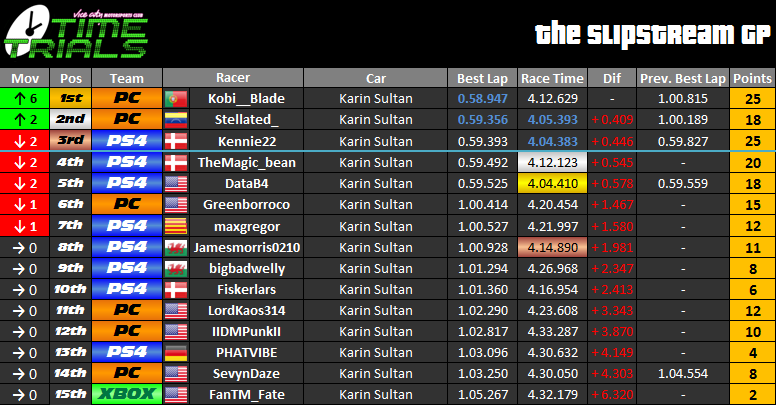 Another detail... the previous variable points system was good when we were more than 20 drivers on every race at least. Now that we are few a fixed points system makes more sense. You are a math wizard! Well that explains it all, why you guys stopped this fun races! I wish there was more people in it too so we can all talk more and meet each other in the Crew. Specially since I'm still new here! So far I only been playing GTA V so the Crew events I can go to are limited! You saying you guys didn't do more racing seasons, because two guys weren't available? Pass the torch humans! 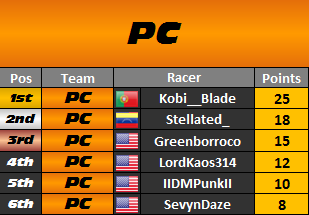 I wanna do lots more racing seasons with the Crew, it is extremely fun and better than doing Heists all day. I'm sure there's more people willing to help like Stellated, I would like to help but I'm afraid I'm lost regarding what I could do to help. Start with Broughy the you tuber. We invited him once but was a no show. Get a dev to join us. Kennie would love to beat them. How can I join the race seasons? Goto vice motor sport in gta thread. 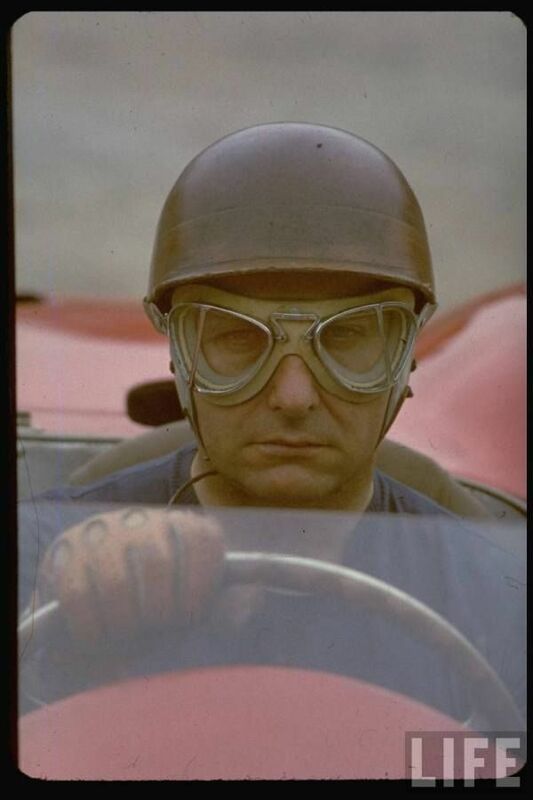 Read race 4 rules. Need help? Dont be afraid to ask.